The Ancient Order of Hibernians condemns the recent bomb attack in Derry which occurred this past Saturday, 1/19/19. There can be no rationalization, no palliation, of such a reckless and indiscriminate attack. The Hibernians are grateful to a merciful providence that reports indicate no one was injured in this wanton act of violence. 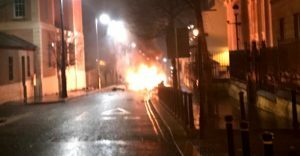 The Hibernians are concerned over the continued political vacuum in Northern Ireland, a vacuum in which acts such as Saturday’s violence find sustenance and flourish. This weekend’s attack is a wake-up call to all those who believe that the issues of Northern Ireland ended with the signing of the Good Friday Agreement. The Good Friday Agreement was not conceived to be an end, but a beginning; an opportunity to leave the well-worn paths of conflict and begin a new journey down the road of peace, a road whose bedrock is parity of esteem. Yet in recent years, the peace process has wandered off course due to lack of the world’s attentiveness. Twenty years on, the Good Friday Agreement commitments to justice and equality are yet to be fully delivered. For over two years one of the Good Friday Agreements most compelling successes, the devolved power-sharing Stormont Government, has been in collapse. The community of Northern Ireland’s belief in the peaceful institutions of government has been repeatedly shaken by scandals such as the Renewable Heat Incentive (RHI). A shambolic Brexit, in direct contravention to the democratically expressed will of the people of Northern Ireland, threatens the economic renaissance which is the unqualified success of the Good Friday Agreement. Even unfinished, the Good Friday Agreement is a beacon of hope to other nations mired in sectarian conflict. For members of the British parliament to irresponsibly claim that the Good Friday Agreement has “run its course” because it is an impediment to their Brexit ambitions is deplorable; it adds to a sad history of British claims of suzerainty in Northern Ireland while abdicating responsibility. Violence, such as that which occurred in Derry must be confronted, not only with a law enforcement response to the incident but at its root cause. Confidence in the peaceful and just institutions of governance must be restored in Northern Ireland. The promises of the Good Friday Agreement, too long delayed, must be delivered upon and not sacrificed on the altar of Brexit expediency. It was United States involvement in the form of Special Envoy George Mitchell that created the environment that made the Good Friday Agreement possible. United States involvement is needed again to ward off a potential unraveling of twenty years of post-Good Friday Agreement progress and one of the landmark achievements of US diplomacy. The Hibernians remind the President of his commitment to appoint a Special Envoy to Northern Ireland. We must not for inattention allow the light of hope in Northern Ireland to sputter out and to be overtaken again by the darkness of violence.